IRTA bestowed a number of awards to deserving recipients at its 34th Annual International Convention held from September 19th through 21st, 2013 at the Venetian Resort Hotel in Las Vegas. Annette Riggs received a President’s Excellence Award from the IRTA Global Board of Directors for her outstanding leadership and advocacy work on behalf of IRTA and the retail barter, complementary currency, corporate barter and counter-trade sectors of the industry. Lois Dale was named 2013’s Hall of Fame recipient for her 29+ years of devoted service to IRTA and the barter industry. Terry Brandfass received the 2013 David Wallach Outstanding Achievement Award for her energetic and passionate efforts to enhance the industry. A record number of twenty-four individuals took the Registered Trade Broker (RTB) and Certified Trade Broker (CTB) programs and Kim Strabley and Dea Allgood both received Paul St. Martin Awards for their tireless contributions to these important industry educational programs. IRTA Legend of Barter Awards were also given to John Strabley (IMS), Lois Best-Mercier (Metro Trade), Mike Krane (Greenapple Barter), Debbie Lombardi (BBU), Scot Mathewson (iTradeearth), Paul Bolte, (Bartercard) and Bruce Kamm (Virtual Barter). Trevor Dietz, COO of Bartercard received an Outstanding Achievement Award for his selfless service and assistance to IRTA. 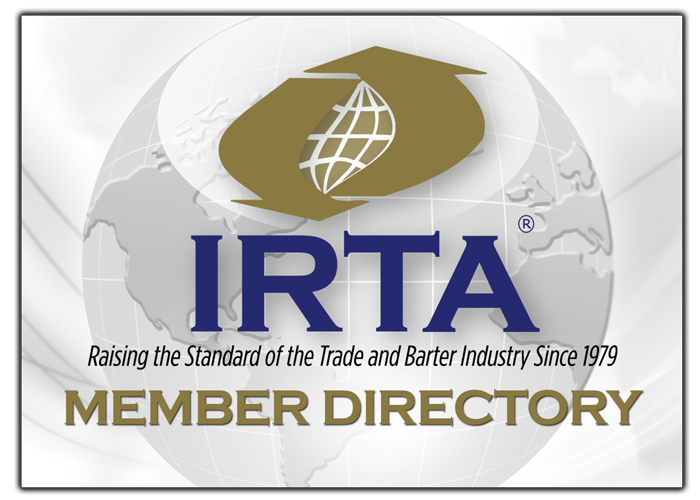 IRTA has recognized excellence in the barter and trade industry for the last thirty-four years. IRTA encourages all industry participants to help IRTA preserve, protect and enhance the barter and trade industries by getting involved with IRTA and its international trading platform, Universal Currency Clearinghouse Inc. (UC).